I did finally finish that quilt for my little girl, and well in time for her birthday. 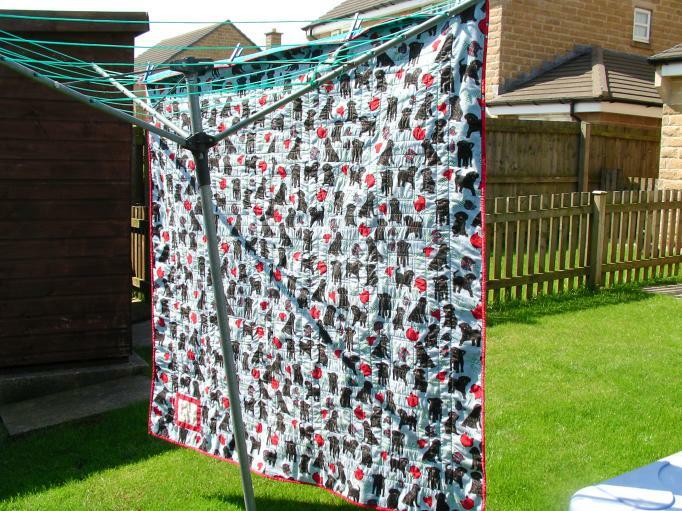 Here are some photos of it hanging on the clothesline. It has simple outline quilting around the squares. The backing fabric is black labrador dogs on a blue background (I think I bought this at Wal-Mart maybe 12 years ago?). She loves dogs! Now on to other projects, and no procrastinating this time. 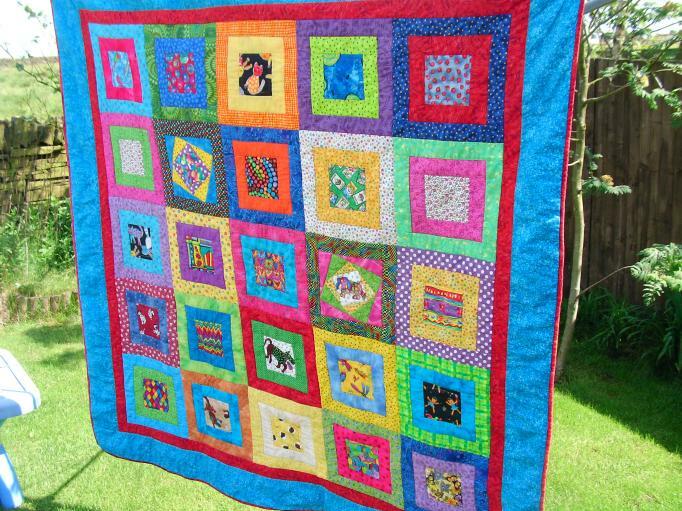 I love the look of your ‘I Spy Birthday Quilt’. Do you have a pattern I could borrow/buy/get a copy of? I am looking for something interesting for my textiles class. I think they could make a block each and then put it together. Hi Tania, it’s a pattern I made up along the way based on a quilt I saw in an Australian quilting magazine. I’ll be happy to send you the notes I used. There are many similar patterns, too — Cobblestones, Boxed Squares, Framed Squares, etc. I love this pattern because it’s easy to do with small quantities of fabric and is great for using scraps, and you can make the blocks any size you like. Thank you for visiting. Take care.